In David Blackburn’s own words, “wood art is the tree that never dies.” David’s pathway to exquisite woodworking has not been a straight line. It began as child’s play and grew through a tour in Viet Nam, working as a youth minister with Campus Life, subsequent careers building patio covers, doing home remodeling and supervising construction. In 1979, seeking out additional sources of income, he began to build cigar humidors. It was then that the mystical, poetic heart and soul of David’s art emerged. His mind opened and a stream of sketches and ideas flowed. Because David “reads” the wood, his boxes and furniture are not always square or rectangular but are formed with the natural flow of wood. 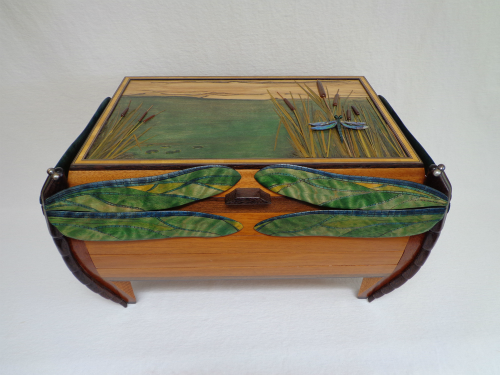 Color, grain, texture, rare and exotic woods, burl, pattern and natural edges create complex and intriguing works that are interactive, with hidden locks and compartments that contain scripture or poetry. He has won numerous awards and has been widely published. David Blackburn’s documentation took place in October of 2013 and was sponsored by Tracy Long and Don Taylor. The FOTM Archive contains extensive information about this artist.